Note: AOL Members.... DO NOT USE THIS FORM. It will not submit the data correctly. I'll get a blank e-mail. The intent of this registry is to gather original corvette specifications as delivered from the factory for as many 1970 Corvettes as possible. Dealer installed options (such as side pipes and passenger side mirrors) are not being considered or tracked in the database at this time. In order to develop a statistical database, a large number of data entries are required. Please feel free to enter information, even if incomplete. Include my VEHICLE SPECIFICATIONS in the ONLINE database. Include my FIRST NAME in the ONLINE database. Include my LAST NAME in the ONLINE database. Include my E-MAIL ADDRESS & First Name in the ONLINE database. Include my CITY in the ONLINE database. Include my STATE in the ONLINE database. Include my COUNTRY in the ONLINE database. I am a car dealer / service center and have had access to this vehicle. Anonymous... Can't say where or how I saw this car! And don't list my info online either please. Please enter the 1970 Corvette OWNER Contact Information (leave blank if unknown). Enter the Build Sequence Number - This is the last 5 digits of the Vehicle Identification Number. The VIN is found on a plate riveted to the driver side windshield pillar, visible through the windshield glass. Ie, VIN 194670S404102, enter 04102. Which engine originally came with the car? The Trim Tag is located on the driver's door jamb below the windshield pillar post. This contains factory ordered color and trim options. Please read the codes carefully, for example, 3 and 8 are often difficult to discern. 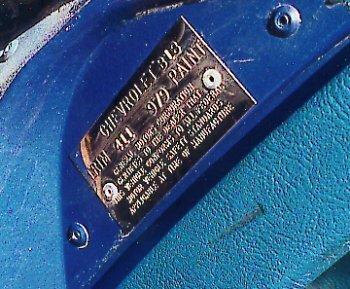 The example shown is Juliet's car, Build date B18 (Feb 18, 1970), Interior Trim 411 (Bright Blue Vinyl), Exterior Paint 979 (Bridgehampton Blue). Please select from the following factory Options only those which you believe to be original, as delivered from the factory, back in 1970. Please enter any other pertinent information such as awards, current color, engine and options if modified since original or any other information you would like to appear in the online registry. Please keep it short & use common abbreviations. 180 characters maximum. How did you learn about the existence of the 1970 Corvette Registry? Please enter any comments or questions here. 1970 Corvette Registry Input Data Form. Revision 12/28/2009. Copyright © 1999-2009 Juliet Page. All rights reserved.